Starting your day off right is an important thing, especially if you are dieting. I'm personally a big fan of eating low calorie cereal with almond milk for breakfast (when I don't have time to make delicious low calorie pancakes). And, I'm always on the lookout for yummy new cereals for breakfast. Even more-so I'm always on the lookout for low calorie granola substitutions, since I love granola but don't get to eat it very often because it is so high calorie. 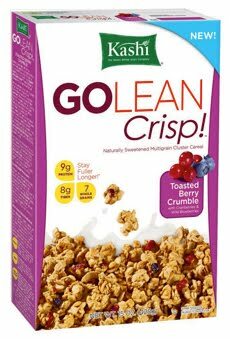 So, I was thrilled when I brought home Kashi's Go Lean Crisp, which to me is much more like granola than just plain old cereal. There are also little cranberries in the cereal, which make it both chewy and crunchy -- super yum! I've been experimenting with the Go Lean Crisp "granola", eating it not just with almond milk, but also with low fat yogurt, frozen banana and other frozen fruit to make a delicious parfait. I also have tried combining it with a handful of nuts and chocolate chips for a really crunchy and yummy low calorie trail mix snack. It is also great mixed with pb2. Kashi’s Toasted Berry Crumble is 180 calories, 3.5 grams of fat, and 8 grams of fiber, and 9 grams of protein for a very large 51 gram serving (most cereal servings are around 30 grams). It is super filling with all of the fiber and protein content. This is 3 weight watchers points! Combined with a cup of almond milk, it makes a 4 weight watcher point breakfast. I'm a big fan of Go Lean Crunch ... so I will definitely try this. I like the added cranberries and you can't beat that crunchy texture. Yum! Although this is a delicious cereal,it is rather high in sugar 12 gms per serving. I have found that clients of mine who eat this and other very sweet cereals tend to crave sweets and or get hungry shortly after breakfast.